Is there any figure in Hollywood more controversial than Mel Gibson? Sure sometimes the guy is flat out loony but he's a tremendously talented filmmaker. “Hacksaw Ridge” is yet another directorial success and his first film since 2006's “Apocalypto” a film I dreaded seeing but found absolutely thrilling. Say what you will about “The Passion of the Christ” it has some amazing technical merits. And no one will argue that there's much wrong with his Oscar-winning epic “Braveheart.” “Ridge” follows the true story of World War II veteran Desmond Doss who declared himself a “Conscientious Objector” and was the first to be awarded the Medal of Honor. It's fascinating story about an interesting person made palpable by Andrew Garfield's charismatic performance but the film truly shines in the film's later half as Gibson puts some truly horrifying and heart-pounding war footage to film. “Hacksaw Ridge” sort of reminded me of “Full Metal Jacket” in its structure. 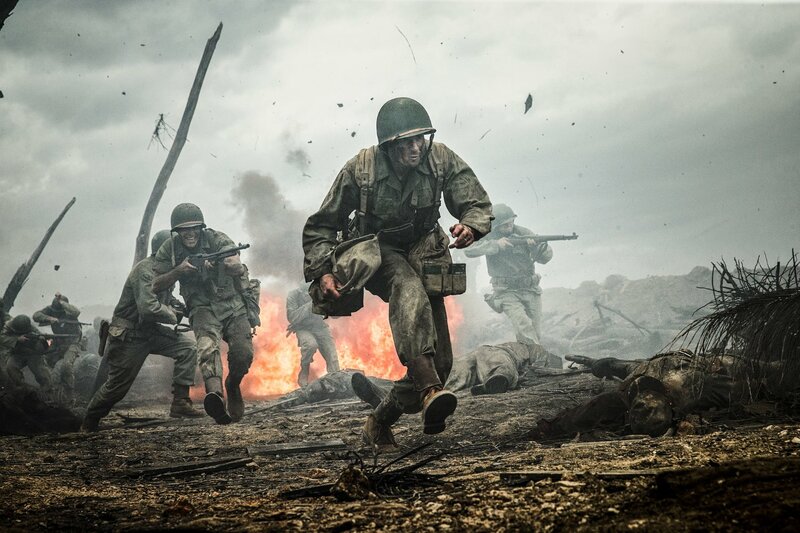 That film followed a group of marines its first half as they made their way through training while the second half of the film followed them into battle. We're introduced to Doss as a kid growing up in Virginia and is extremely religious. His dad is a war veteran and rather abusive and an alcoholic. After a horrible accident involving him and his brother Doss becomes a changed man. He refuses to see violence as a means to an end. Then second World War begins. He woos a young nurse played by Teresa Palmer and feeling the need to support his country, enlists, but only if he can work as an army medic. He refuses to even carry a gun which raises questions to those in charge. It even becomes a matter of the law. You can tell Gibson gets the religious, preachy aspect of Andrew Knight and Robert Schenkkan's script, but I kind of admire someone who is so devout yet rejects weapons. Sometimes the two are disturbingly intertwined in today's society. Or course luckily for us viewers, Gibson's real bread and butter is of the brutal nature. The film's second half follows Doss as he enters into the Battle of Okinawa which was one of the largest water-based assaults in the Pacific War during World War II. 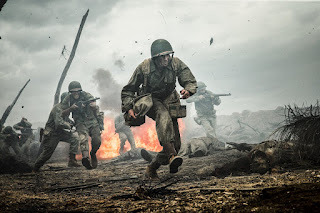 Gibson easily shows the horrors of battle, which is nothing particularly new, but this sequence is graphic in a way that makes the violence in “Saving Private Ryan” seem mild in comparison. Gibson even throws in some thrilling moments as Doss does his best to save the injured in battle and evading the enemy at every turn – without ever picking up a gun. Trailer for Hacksaw Ridge on TrailerAddict.